The main reason is that, as you can see, Okodia – Translation Group is the agency of choice for a wide range of clients in different industries. From corporations to SMEs, entrepreneurs and private clients that entrust our team of professional translators with their projects. SOLUTION 1: Improve your internationalisation. Even though every industry is unique and different, we all have something important in common: we share the same economic scenario, the same difficulties positioning ourselves and maintaining a strong presence in a globalised market. Like yours, many companies find a viable solution abroad every day. Indonesia, Sri Lanka, the Philippines, Colombia, Peru, Ethiopia, Bangladesh, Kenya, Zambia and Tanzania are ten countries with an “emerging” economy, a market niche which companies – your company – should enter. 1. We have real knowledge of the local culture and idiosyncrasy in every country. 2. We know the language in which you want to sell perfectly. 1. We have the best native translators into the language in which you want to sell. It’s a proven fact that offering your products in your clients’ local language significantly increases sales. That’s why our clients come back. 2. Our translation team works in more than 40 languages. That’s why you achieve a global presence in one single step. SOLUTION 2: Your specific needs, our specific, personalised solutions. If every person is a world, every company is a universe. 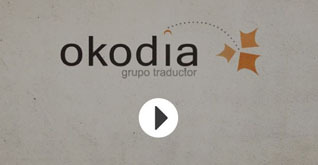 At Okodia – Translation Group we are much more than a mere service provider: we really become involved in your project. We examine your needs from a realistic point of view, and, with our feet firmly on the ground, propose specific solutions for specific needs. At Okodia, we do not theorise: we forge ahead and find solutions. One of the traits that our clients rate the highest is our level of personalisation and commitment. At Okodia, your company is not just a number: it has its own name and surname. We are people working for people. We are not an “entity”: we are a group of professionals who work thinking in the first person. In you. Insurance agencies, banks, advisory services, communication agencies, telecommunications, law firms, dental clinics, beauty centres, dog grooming salons, veterinarians, shops, construction companies, architecture firms… All companies and all professionals share a common need: growing and becoming consolidated in the market. Okodia – Translation Group has the value of being the linguistic partner that knows your end client and is able to translate your messages quickly and professionally at competitive rates. Are you sure now? Write to us and see for yourself. Wishes to optimise the investment made in their international projects. Needs to capitalise on the budget spent on the translation of its products and services. Wants to successfully enter the markets in emerging countries. Wishes to obtain maximum profitability with foreign tourists. Needs to expand its client portfolio with people and companies that speak other languages. Has any reason to speak other languages. Then you have just found the best translation solution: Okodia – Translation Group offers it here and now. You just have to take the first step: we’ll walk the rest of the way together.